The “Jaws of Life” had to be employed to free an unidentified woman from the wreckage of this Nissan Versa following a crash shortly before 3 p.m. Wednesday. Traffic was blocked in both directions of U.S. Route 62 near the Wright Road intersection for almost an hour. A female driver was sent to Highland District Hospital following a one-car rollover crash shortly before 3 p.m. Wednesday on a straight stretch of U.S. Route 62 north, approximately 500 feet south of the Wright Road intersection. The driver of the late model Nissan Versa, whom the Ohio State Highway Patrol said it was not allowed to identify, was alert when removed from the vehicle about 45 minutes after the crash. 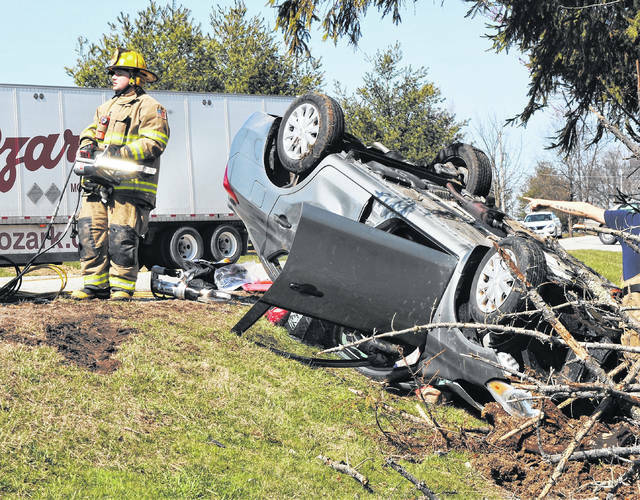 Emergency crews from the Highland County North Joint Fire and Ambulance District, who responded to the crash, had to use the “Jaws Of Life” to free the driver from the overturned car. The crash was witnessed by Teresa Garrison of Mt. Sterling, who was southbound on U.S. 62 and observed the Versa going northbound. “I saw her drifting off the right side of the road and then it looked to me like she overcorrected, went left of center, and then flipped it,” she said. The Ohio State Patrol had U.S. 62 closed for about an hour to allow emergency personnel to secure the accident scene, which was an area of the highway that nearby resident Stacy Allen said has seen close to 100 accidents in the 30-plus years that she’s lived there. The highway was reopened to traffic about an hour later.